In honor of Nate Berkus re-airing his “Gray is the New Neutral” episode today, I decided to repost an oldy, but goody from my archive. What I love about this most, is that I said it first! =) Way back on April 8, 2010! And the trend is still going strong. I’ve added some new photos at the end too. Gray may be in the cool tones, but right now it’s HOT! HOT! HOT! And some of the most pleasing shades of gray have a warm hue to them. Just take this dining room as an example, paired with a beautiful cream it makes for a very warm and inviting room. 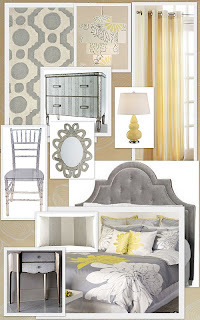 Another trend is pairing gray with a sunny yellow… a play on silver and gold. 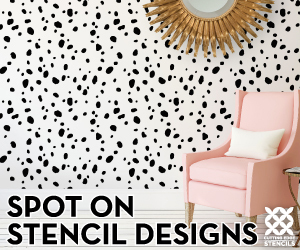 Think of a sleek sofa upholstered in a gray suiting material with some punchy yellow bold floral pillows and putting a subtle gray on the walls. YUM-MY! I love this kitchen/dining room. The crisp whites juxtaposed next to the deep gray actually creates a certain brightness to it. A chic monochromatic example. Of course, I love the animal print (in moderation). 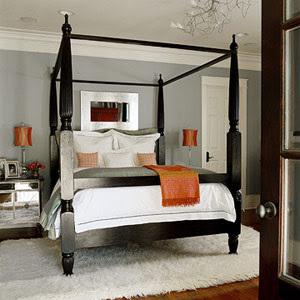 Another example of pairing a hot color, like orange, with gray making a warm friendly feel. 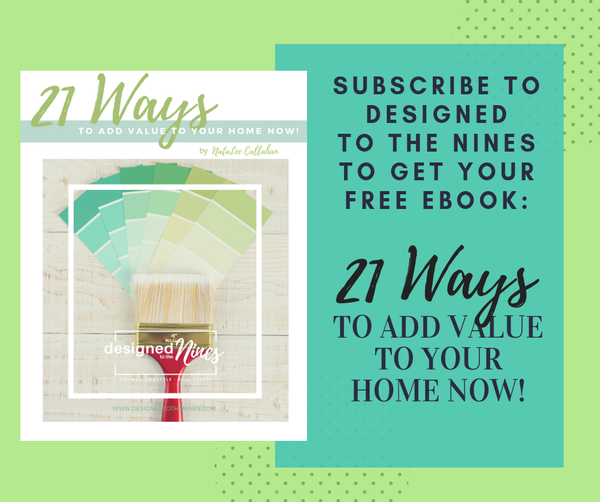 So the next time you think about paint your walls… I urge you to walk past the beiges and tans and go to the gray paint chips in the paint store. 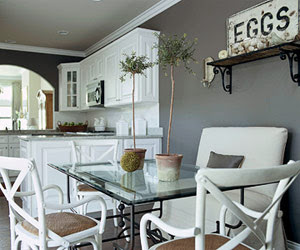 Consider a gray sofa… In my opinion gray is the hot, new neutral. 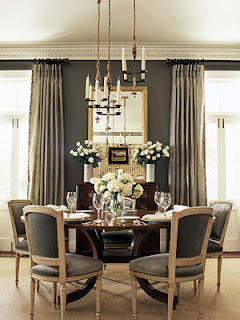 The window treatments are a little fussy for my personal taste, but I like the gray trim in this room. I love a good laundry room. Purple and gray is a hot combo… I like the pop of green in this room. Tile work in this bathroom is exquisite! Last but certainly not least… one of my favorite blogging ladies… Shelley from www.thehouseofsmiths.com created the most fantastic photo wall with of course gray walls behind. Have you gone gray? Where and how did you use it? *I always strive to give credit where it is due, a lot of the photos used are from random google searches. If you recognize a photo, please let me know so I can give proper credit. so much fun to have to look at! I loved this “gray post”… ha! SUCH pretty rooms!